If you could go back in time and satisfy an unfulfilled dream, what might that be? If it’s actually buying that coveted Volvo wagon then have a look at today’s Nice Price or Crack Pipe 245 since its a real time machine. Of course, going back does come at a price. There once was a time when Citroën sold cars in the U.S.—through actual Citroën dealers no less! That was way back in the day, and since 1974, when the marque packed up and left the country, it’s been up to intrepid private importers and small scale federalizers to sate our nation’s appetency for Gallic pomp and quirkumstance. One such car to do so was yesterday’s 1982 Citroën CX Pallas IE, which was claimed not just to be here legally, but to be so in California, the most difficult state in the union when it comes to flouters of emission standards. That was just one hurdle for the car to overcome. Others included some road rot creeping in at the corners, as well as various electrical, mechanical, and aesthetic issues that would need to be addressed at some point. None of that seemed to matter however, at least not to the 58 percent of you who anointed that CX’s $4,800 price tag with a Nice Price win. Tres bon! France is one of the oldest auto-making nations on the Earth, and in fact an appreciable number of common-day automotive technologies—things like the steering wheel—where invented there. Sweden, on the other hand, has had a much shorter time on the auto-making stage. Volvo, the nation’s largest car builder, didn’t even roll out their first model until 1927. In fact they had to postpone that initial car’s debut since someone installed the prototype’s transmission incorrectly and upon its planned entrance it went backwards instead of forwards. In the ensuing years Volvo has managed to not only get the whole screwing cars together concept down, they’ve also engendered a reputation for building cars so stoutly that they—along with the cockroaches and much of Taco Bell’s dollar menu—are most likely the only things to survive the coming armageddon. 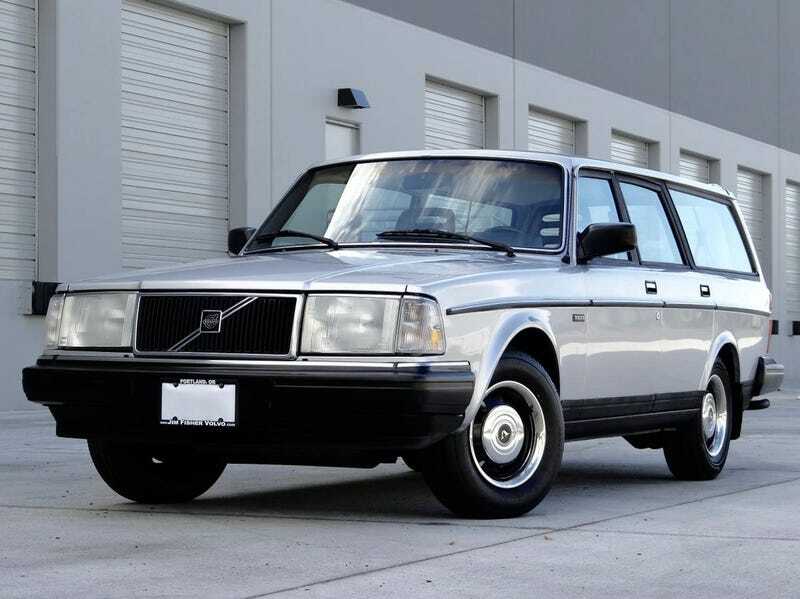 This is just such a car, a 1987 Volvo 245 DL wagon, and oh man is it sweet. Here’s a fact to chew on: it’s been nearly a quarter century since the 200-series last rolled off the assembly line. That’s a good chunk of time in people years, it’s pretty much dead in dog years, and in car years it oftentimes means clapped out or junkyard denizen. Take a look at this 245 and be amazed. Holy cow, it looks freaking brand new! This is a two-owner car with just 128,000 miles on the clock, but those miles must have been covered while coated in bubblewrap. No, it’s not a turbo, but it does rock the appreciably rare five-speed manual so there’s some fun to be had. It’s also a Volvo 200-series so potentially your great grandchildren could share in that fun. The silver paint looks to be in as-new condition save for some touched up chipping in front. Is it the original? That’s hard to say, as there’s some indication under the hood that it has seen a respray. The rest of the engine bay is clean as a bean and there is no mention in the ad of any mechanical maladies. The only things belying the car’s actual age are a peeling label on the coolant reservoir and the fact that the 2.3-litre B230F only puts out a meager 114 horsepower. Remember though, slow and steady wins the race. The interior is equally a time warp with perfect vinyl-covered seats front and rear, and even a Volvo-branded stereo in the dash. What’s missing is the third row but I’d wager you’re not likely to find a 245 in this sweet of shape outside of a museum or your fantasies. Of course, such shape commands considerable compensation, and this car’s seeming only sad trombone is its $14,500 price. Yes, that’s a lot of beans. The question is, could this car really be worth it? I mean, look at those steelies! I’ll bet it still has its new car smell hidden away somewhere, maybe in the glovebox. So what do you think, is this rare, seemingly fabulous, 245 DL worth that $14,500 asking? Or, is this a time machine with a price that you wouldn’t give the time or day? New York, NY Craigslist, or go here if the ad disappears. For $2,950, Is This 1985 Volvo 760 Diesel Your Dream Stripper?